Methi greens is another vegetable that is winter staple in India. And when cooked with dal makes a wonderful combo with rice and papad. This is yet another recipe from my favourite cook book "cooking with Pedatha". 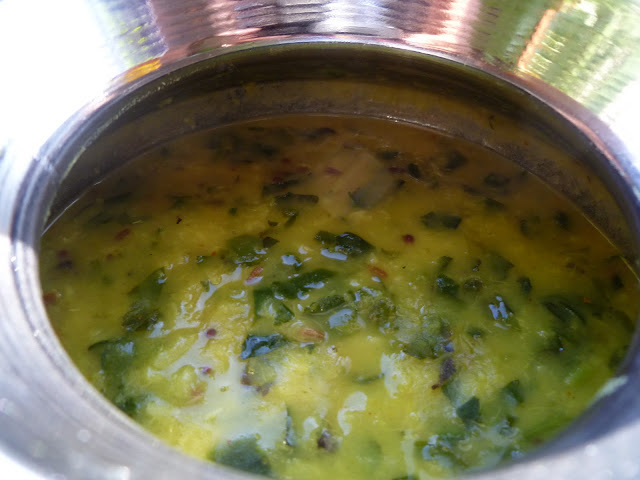 Cook dal with a cup of water and turmeric till soft , churn well and set aside. In a pan , heat oil for tempering and pop mustard and cumin. Add the red chillies and wait for 30 seconds and add the greens. Cook covered till the methi is well done. Add the cooked dal , green chilli and curry leaves and continue to cook for few minutes. Add the lemon juice and remove from fire. Super healthy and fabulous looking dal. Nice recipe Nisha:) Thanks for the follow at my space, glad to follow you back..